Remodeling the bathroom can mean creating an oasis inside the home. Bathroom projects are fun with ProSource® of Stamford. Our team of experts work with trade professionals and their homeowner clients to pick out the best products for their bathroom remodeling project. Not only are we design and product specialists, but we help professionals get good deals on prices when you’re ready to buy. As one of 145 showrooms across North America, our Stamford showroom can leverage large buying power for lower costs for our customers. Learn more about the different bathroom remodeling products we offer. There’s no such thing as a one-size-fits-all sink these days. 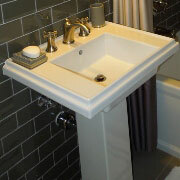 Today, you can choose sinks by color, material, type, shape, drain location, or the number of faucet holes. Browse through the catalog or learn more about our wide selection of sinks. Add a new faucet to the new sink as part of the bathroom remodel project. Faucets are both aesthetic and functional pieces for the sink. 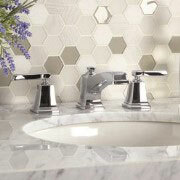 Pick a faucet by handle design, number of holes, style, or material. Our team can help you pick out the best shower heads, faucets, handles, and more that make a shower come together. Trust that ProSource can find the products you need to create the ideal shower for your homeowner clients. The bathroom vanities are beautiful pieces of furniture that help increase storage options for better organization in a small space, and they add a unique aesthetic look. 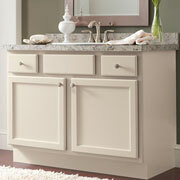 Bathroom vanities come in a variety of sizes, shapes, and colors. Browse the catalog to see for yourself. 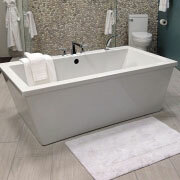 ProSource can help you find the right tub for your project by listening exactly to what your client desires and delivering a tub they expect. From standalone tubs to built-in tub and shower combos, this bathing space can be a relaxing escape, too. Some may see a toilet as just a toilet, while others recognize that this is one of the most-used pieces in the bathroom and should be chosen carefully. 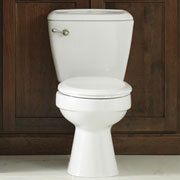 Work with ProSource to determine which toilet features matter most to you.